I've got a wonderful stack of letters from people applying for the Martha Weston Grant through SCBWI. I'll wait a couple more days for the last few to wend their way through the mail, and then send them all off to the two other people on the award committee, Anna Grossnickle Hines and Susan Bartoletti. This is very exciting -- I can see we have a really strong applicant pool this year. Thank you to everyone who applied. A special shout-out to Laurie Halse Anderson for spreading the word via her blog post. She rounded up a bunch of cool applicants who might never have even heard of the award! Thank you!! And a special, excited congratulations to Laurie who was JUST honored with the 2008 ALAN Award. Read about it here. And there's a fantastic article up on PEN's site with Markus Zusak and Susan Campbell Bartoletti. They are the first-ever authors featured in PenPals, an e-mail conversation between writers and illustrators of Children’s and Young Adult books. Writing on different continents, they both covered Nazi Germany in their books: The Book Thief (Zusak), and Hitler Youth and The Boy Who Dared (Bartoletti). Here's how Bob Lipsyte describe their conversation: "Read Markus on “the magic act” of creating fiction that you come to believe is true and Susan on the writer’s job of finding and describing that place where “darkness and light…smack up against each other.” I found the amazing document that follows funny, wrenching and ultimately comforting and inspiring." 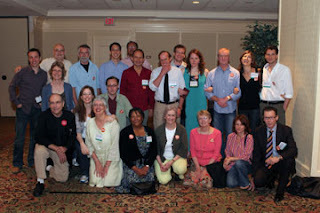 One more story: Markus Zusak and I both honored at first YA Author Breakfast at ALA Annual last year. 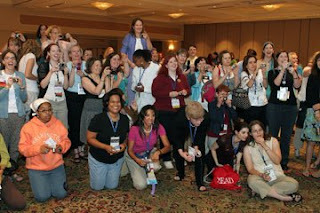 We went from table to table with an incredible group of YA authors in a wonderfully crazy author speed-dating. I followed Markus, and have to admit, I was as star struck as anyone, and had a tendency to want to stop and listen to him rather than talk about my books! I just found a lovely cache of photos of the breakfast right here. Here we all are, and here's what we saw: Fun morning!